Science Boffins have a great reputation for the provision of entertainment at school science fairs and fêtes. We can provide an activity table so that passers-by are engaged with a variety of challenging hands-on science experiments that will have the crowds milling around to see what is happening. You can even ask for the ever-popular slime making to be included so your guests have a special take-home gift – a must for all budding young scientists! Our Boffins can also perform a show, generally about 30 minutes long, to a gathered audience. 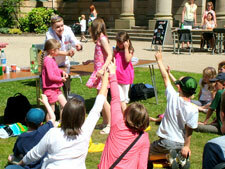 These demonstrations contain some of the flashier experiments which are sure to wow everyone. Or, why not get the best of both worlds and combine both a table top activity stand and static presentations at pre-set times? If you would like more information or wish to make a booking, please either call us on 020 8953 5566 or complete our enquiry form.